The Z Beat: Welcome y Bienvenidos! If you're reading this blog, you're probably already a Zumba-er (Zumber?) - you're here for the inside scoop on music, choreo, events. If you're new to Zumba, check out the home office's website for the basics. I have to confess something before we get any further: I hated my first Zumba class. I had a dance background and liked to work out, so it seemed like a no brainer. I was not expecting to be in a crowded room with 20 people who knew exactly when to single-single-double and what to yell along with the music. It felt like being mixed up in the mariachi military, with everyone stepping to the beat but me. It took a few months for the trauma to wear off. I tried again and found a few instructors who I absolutely loved, and I started going to classes three times a week. In May 2013 I got certified to teach and now I teach twice a week in Long Island. I'm still not your typical instructor - I have yet to buy a pair of Zumbawear pants and I don't yell wepa! in class (ok, once in a while when I'm REALLY feeling it). I'm just an average person trying to do something I love to stay in shape. 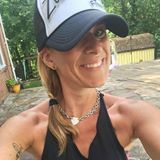 Join me as I chronicle life as a Zumba instructor and aspiring wellness aficionado, share information about the latest moves and music, and provide reviews of events and products that I think you'll find useful. I can't wait to hear from you: TheZBeat@gmail.com or @TheZBeat.